Call it Demographic Dividends 202. Another lesson from professor Joel Kotkin on the link between demographics and economic growth was published at NewGeography.com yesterday. It's another Kotkin must-read. His piece reviews Census and WTO data predicting labor force and population declines in other countries for which the U.S. competes for production capacity. He reminds us, "The populations of long term competitors among advanced countries—including the European Union, Japan and Russia—are all expected to stagnate and then decline." He makes the case for letting immigration run its course. 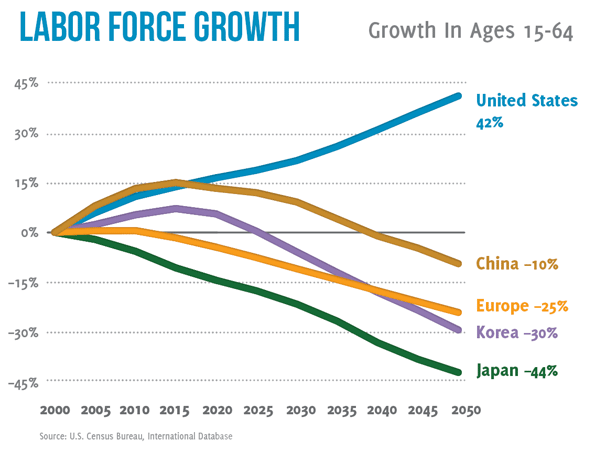 Immigration is a part of our "demographic dividend." Kotkin concludes with a warning of mimicking the policies of the EU and elsewhere, saying, "A growing population may create great environmental and economic challenges, but it seems clear that a scenario of persistent decline and rapid aging presents a far worse prospect."